Does Your Warehouse Give you a Competitive Advantage? Today’s business landscape is more global and competitive than ever and customers are no longer as loyal as they would have been 10 or 20 years ago. Customers are now much more discerning and demanding. Failure to meet their expectations on price, quality and delivery will likely lead them to look elsewhere for someone to better meet their needs for future orders. Most businesses understand these pressures and market forces and have made strides to meet them and to maintain and where possible, increase their market share. They’ve cut costs and made changes to become leaner and more effective. Sales techniques have changed to ensure that the more knowledgeable customer is treated with the respect they deserve. Product lines have been increased to meet the greater demand for variety and specific solutions, but these on their own are not enough if you can’t consistently get the product to the customer on time and as ordered. This article highlights the critical role that warehouse and distribution functions can play in these challenging times and when these are executed effectively, they will set standards in fulfillment and customer satisfaction that will lift your company above your competitors. Most companies would agree that an effective supply chain is vital to the success of their business, but they don’t necessarily back that up with the investment in people, resources and systems to make it happen. While these same businesses spend vast sums on marketing and sales to generate the incoming demand for their products, they invariably neglect key elements of the supply chain required to get the promised goods to their customers on time. Even within the supply chain there appears to be a ranking of importance. The further down the chain you go, the less attention is paid by senior management and as a result these key links are deprived of the necessary investments needed to make them work optimally for the company. Interestingly, the functions closest to the final touch point with the customer are those deprived of the care and attention needed to make the customer experience exceptional. This is not the case with leading brands. They recognise that a key differentiator, especially in markets where the products have been commoditised, is the ability to fulfil promises and deliver quicker and more accurately than your competitors. This gives these businesses a key edge and allows them to begin to make and keep promises that others in the market can’t seem to attain. These businesses have recognised that investing in the facilities, people, processes and systems that manage their stock and distribute the orders promised to the customer is the key competitive edge that they need. They also know that doing it well, will keep them ahead of the competition much longer than any other changes they could make to pricing or promotional activities. Maintain accurate stock levels and be able to receive and despatch products quickly in order to keep inventory levels and costs low. The length of time it takes to become world class at distribution depends on what your current situation is. Essentially though we believe there is a six stage recurring process necessary to get there and to stay forever ahead of the rest. Look at your current processes, if they are not documented, get them documented. Decide: can we conduct this on our own, or do we need a partner? In order to understand what is possible and how far away you are from perfection you need to get out and have a look at companies that are the best at distributing their products. Do some research and ask to see the facilities of companies that have gone before you and set the standards for warehousing and distribution. There are also some highly recommended benchmarking questionnaires that you can use to self-assess your performance against recognised best practices. Use the information you get from these visits and the results of your internal surveys to establish exactly how you compare to these world class standards. Then take this information and set a vision for what your business should look like in the future, 1, 5 and 10 years from now. This essentially establishes the destination for your journey and will help you to see what type of journey it is going to be. After doing the benchmarking it may be tempting to plough full steam ahead into changing anything and everything about your warehouse. That wouldn’t be a wise course of action. Instead, list all of the areas of improvement identified and group them into functional and physical areas of the warehouse. Take time to decide just how easy each of the improvements will be to implement and what the anticipated benefit of the change will be. Then pick 2-3 of these with which to create projects to get them done. Changing the mind-set of the business to one of continuous improvement can be hard, so it may be wise to look at some of the quick wins identified in the early stages. Being able to see the results of their actions quickly will encourage the staff that this is a worthwhile exercise and will allow them to see the rewards of their efforts earlier. It will then be much easier to tackle the larger, harder projects where a great deal of effort or time may be required before any improvements can be seen. Once the two or three projects to be tackled have been identified then project plans should be established for each one, no matter how small the project is deemed. In addition, a project sponsor/manager is required. This person should be responsible for the follow through on the execution phase of the project to ensure that the project is completed successfully and not lost and forgotten in the day to day operations. If a project requires an external partner, great care should be taken to select that partner and their services and/or products to ensure that they have the experience and track record to perform the tasks required. Clear expectations of the measurable success of each project must be set at this stage. 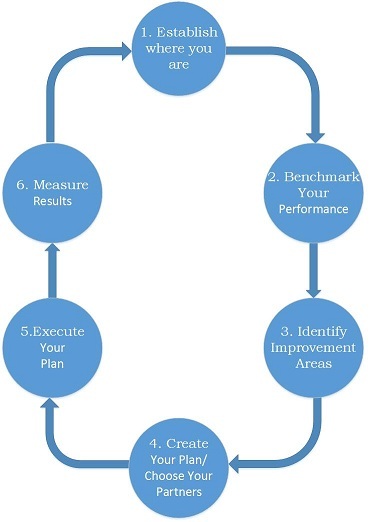 As you will see in step 6, you must measure the outcomes of each project against the expectations to ensure that the projects have been a success and to make sure we are on the path to our ultimate vision. Many businesses get this far in the process but they fail to execute. The most common reason for this is that they fail to appreciate the effort required in executing the plan and therefore do not dedicate the necessary people to the task. Instead, they simply add these projects as additional work on top of their staff’s already hectic schedule, thereby creating a level of resentment in their already overloaded work force. To execute your plan successfully, ensure that the staff who are allotted roles in the project are freed from their normal day to day activities so that they can dedicate their time and efforts to making this a success. After all, these projects have been identified as key elements in the strategy to make you the best in the business and delivering on your promises. The purpose of this journey is a process of continuous improvement, pushing the boundaries of what is possible and doing so as effectively as possible. This means it is necessary to understand the results of what has been accomplished. At the start of each project, clear outcomes were established and you need to ensure that these were met. Measuring these outcomes analytically will help keep you on track and ensure that you are heading in the direction established at the start of this project. Care must be taken in analysing the results not to look at an area in isolation. Sometimes what looks like an improvement in one area will actually be detrimental to the overall operation. Likewise a target set for one area of the supply chain may directly conflict with one for another. For instance, a promotion guaranteeing next day delivery, will almost certainly increase delivery and operational costs. If these costs were measured in isolation it would look, to the business, that the distribution process was becoming more ineffective and expensive, whereas in reality it was helping to improve the business as a whole. Remember that this is not a one-time process. Competitors will eventually recognise what you have done and start to make their own plans to close the gap. Your business is also not static, so the processes and improvements that you put in place now won’t necessarily be what is required in 5 years’ time. The single most important take-away from this is that this process is continual. You must never stop seeking to find new ways to improve your business. Once you have completed the steps you must go back to step 1 and start again. Why do we do it that way? Is there not a better way to do this? Do we need to do this anymore? Only when you get into this habit of continual process improvement will you be able to stay ahead of the pack. Get more done with less and help drive your business forward.